As promised, here’s another great fall outfit idea for work! I purchased these boots before my trip to Vail and haven’t really been able to wear them yet (still warm in Texas! ), but I cannot wait until I can start wearing them regularly. 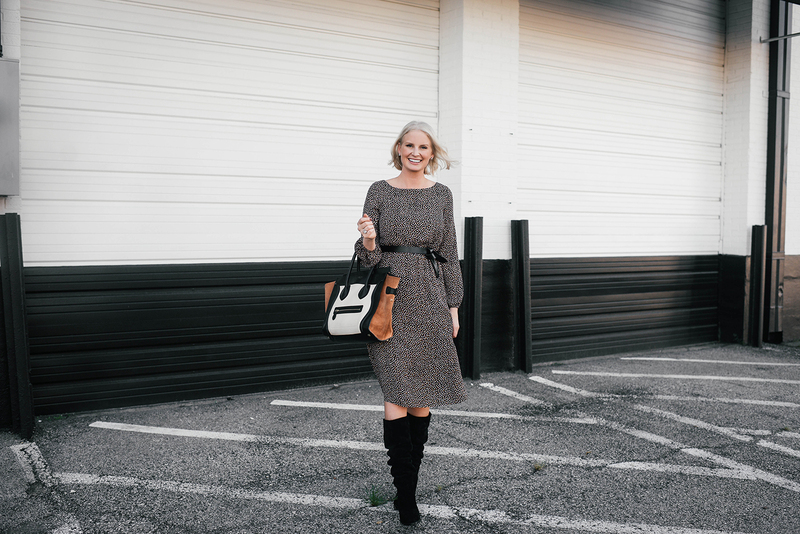 In addition to looking chic and cozy with jeans and a sweater, these boots pair wonderfully with dresses and can totally be styled for the office! At just under $600 these boots are in investment, but in my opinion totally worth the splurge. These boots come in three other great colors too, but I figure it doesn’t get more versatile than black! I already have a flat black pair of over-the-knee boots in leather and a suede over-the-knee pair, but I didn’t yet have a knee high or slouchy style. I just feel like I may get more use out of this silhouette than I will the others. Heads up on sizing: these ran pretty big on me. I’m normally a 9 1/2 or 10 in boots, but I got a 9 in these and still have room for thick socks… Definitely size down! 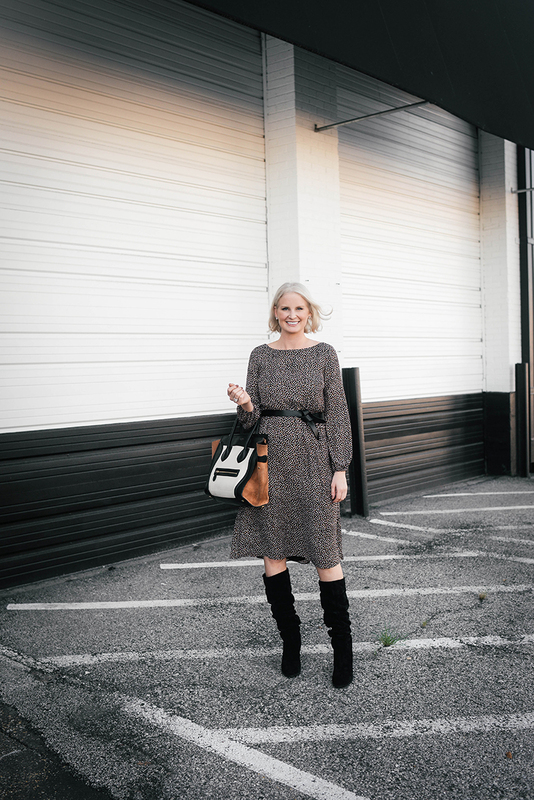 The dress I’m wearing is under $160 and perfectly sophisticated and polished for the office! It comes with its own tie belt, but I decided to swap it out for my favorite Isabel Marant belt to add a more elegant touch. 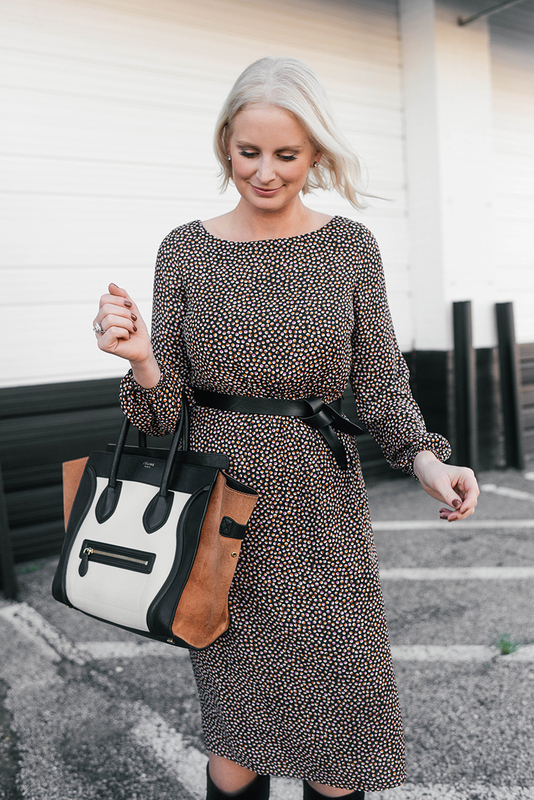 If you’re looking for more pieces like this that work for the office, don’t miss the following items I found at Ann Taylor. So happy with the items I’ve ordered from there so far this season! The print on the dress I’m wearing also comes in this skirt style! Available in all sizes. I love tweed pieces, especially for the fall/winter season. This shift is a great option for important meetings and work events! This winter white coatigan is a good one to leave on your chair at your desk for chilly in-office days! The button detail on this pretty sweater give it a subtle stylized touch. A great neutral for everyday wear and under $80! Looking for a good coat under $200? Don’t miss this one. I’ll be shooting it this week! 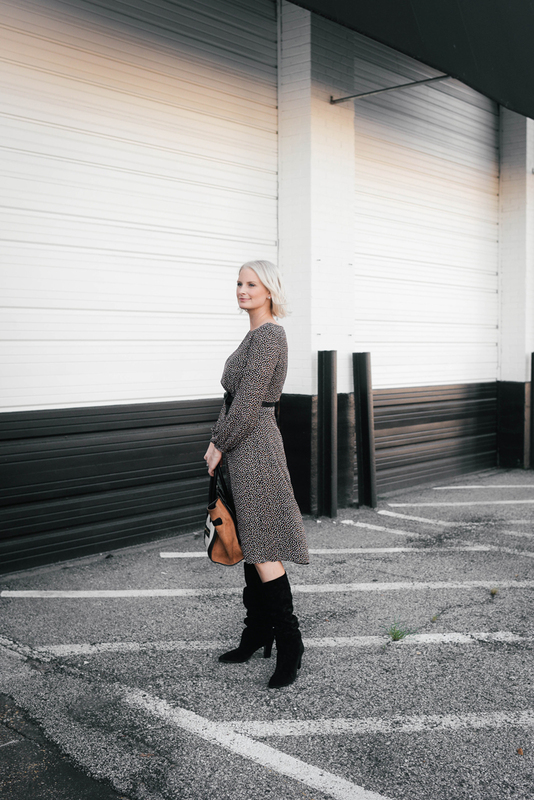 This military-style jacket is another gorgeous tweed piece to have! A great travel staple in addition to a work wardrobe staple. Is there anything more “fall” than plaid? This skirt is a great neutral plaid for wearing with all the things. There are only a few sizes left in this blouse, but I love it! Reminds me of Meghan Markle. This dress is so cute! Would not have thought to pair it with slouchy boots, but it looks so good! Love the dress! What size are you wearing and what is your typical size? Thanks! I’m wearing a 4, and I normally wear a 4 in dresses these days! Hope this helps!